You would be surprised, AK Fan I'm going through many changes in my life at the moment, and this change would be one of the lesser ones. Hmm, I'm positive about guides, but somebody would have to write them. I really appreciate, but I would not be able to accept any donation. Manjikai is quite outdated. Only after I bring it back to life, I think it will be morally right to place somewhere a "donate button"
Do you have any other ideas as how to make Manjikai better? Nothing really pops up right now. I also lead a small clan, or at least I used to lead a clan for a game, I started it 5 years ago and it still has a small breath of life, with activity flickering in and out. My point is, I know what you're going through, and I've tried my best to keep it going. It all came down to the people that come and go, they all have a shared interest and they use the websites we make to keep in contact. The only way we can grow as a community is if the shared interest grows. The game that I made the clan for died years ago, so the website is just used for people to chat, the only reason it's still alive today is because those people that are in the chat became close friends. The only way for me to grow my community is to change the center of interest of the website to something else, be it another game, or console based, but then again that would be too much responsibility for me in my current state in life. I've been watching a lot of Tekken videos lately and thought maybe we can have something like a Tekken Match of the Week on the front page? Love the art we have on here but it doesn't get updated much. Would definitely make it more educational and interesting. Super cool ideas! I wolud try to participate regularly! Yoshi themed achivements seems like cool idea, and having some weekly challenges is great as well. I think would be great for expanding this small core comunity, we have gotten by now. I'm up for the match of the week as well, it's a good idea and it would be great for motivation and inspriation. I'll make a brainstorm and hopefully get some new ideas, that's both realistic and fun. I know this topic is a bit older, but I was looking for somewhere to voice my concerns, so this seems to be a good place. edit: After re-reading my post, I just realised - why not use social media to our advantage?! ^_^ Instagram is very popular with young people, and there's amazing talents on there too. With the right tags, the right people would notice a Yoshimitsu-Manjikai account, I'm sure! ^_^ And somehow we could add a side area with latest posts from Instagram too!! Thank you for your post I want more! The more interest you have, the more I'm encouraged to spend even more of my free time to upgrading YOT. 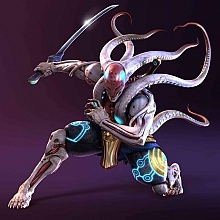 Also the page describing Yoshimitsu and all his info / stories about him will also be updated - with better design and a good navigation through all the content.